Satyam Audio brings back the LP record but to what effect? The Disc release was on July 17, 2011 at the Ernakulam Press Club Hall with B Vijay Kumar, renowned film historian and archivist (our very own Vijay ji) receiving a copy from M Jayachandran. Vijay ji has also written the beautiful sleeve notes for the LP. Though I have always loved the EP’s and the LP discs and have spent a substantial part of my resources ( notice the euphemism 🙂 )in collecting them, I still am at sea when it comes to the commercial viability of such an enterprise, in these times, even though buying the argument of this being a niche segment and Satyam Audios knows exactly what they are doing. Audio CDs of movies as a standalone product has long ceased to be channel of revenue for the producer. The dealer who retails it, is most of the time, the main culprit who peddles the mp3 version of the Movie OST on the side, and let’s face it, for an audio CD that is normally priced at Rs 95/- with one or at the most two popular tracks, the average cinephile would go for the easy way out, buying the two tracks from the retailer through his own private mix cds. The producer gets the short end either ways. Though a shared file on the web is a given, there is also a reasonable amount now made in the form of organised, individual track downloads through ‘enlightened’ music portals and the music wing of the popular media houses. Which all points to the average target buyer of the current songs from the music, the 18 – 35 age group (on an average ). Their preferred media players are their personal devices, and they like to listen on the go, be it from their personal music player devices or their cell-phones. They are also a group that finds great difficulty in coming to terms with the concept of a Long Playing Record and a turntable that plays it, BOTH bulky, clumsy and non-portable. Ensure atleast one local supplier for the state who can provide LP players, which can result in a small churn in new audiophiles trying out the medium and maybe liking it too. ( I just wonder what in the world am I going to do even if I, as a newbie, buy an LP, being carried away by the moment, and realise that I just don’t have any idea on WHAT to play it on ! ). If they need a small but significant rate of conversion in the existing audience, make sure they have both available – the LP and its player. Get as much as catalogue rights of the old tracks, way back, beginning from the Gramaphone record of ‘Jnanambika’ (1940). The baby-boomers’ generation who were used to LPs and EPs, and count on some of them in their sunshine years to be their favorites will certainly buy them, if re-released in the 78 rpm mode. I personally know a lot of them willing to buy a re-release disc of Jnanambika’ (1940), just for the memories. They have announced their next release to be a compilation of Shreya Ghosal’s Malayalam popular hit songs. And I’m thinking, who exactly are they targeting as their buyers ? Darned if I knew. Satyam Audios’ Address at Kochi. They have an online site http://satyamaudios.com/. Please don’t even bother visiting that. The ‘Latest News’ there is still the audio cd release of Yugapurushan (2010)! Would love to know your thoughts. Do write in. You can also read a recent article from The Hindu on the resurgence of LP’s in India here. To get the max quality you have to use a proper record player/amp. I am so dismayed to see these ‘thattikkoottu’ brass windup record players on footpath being sold with *actual* old LP records, which will be ruined after couple of playings on those horrible equipment. I hope those old mechanical gramaphones never get used. Sony has a record player these days for about $100, which should work out to be like 5000Rs. It’s supposed to be pretty good. You will, of course, need an amp and speakers. High-end german turntables, basic ones, cost around $399 (Rs 20,000) in the US. Not sure if importers exist in India for those. Amazon has listings for all. Many are available in the used market. It’s niche Market, I hope they survive for some time. In the meantime, I am going to buy up several copies of the records they release, just in case. I agree 100% with your peeve. While reissuing the new songs are fine, I hope they succeed in getting the old songs (hopefully close-to-original reel-tape recordings) and reissue them after some signal cleanup. But this is a new enterprise, and niche markets would need to be commercially successful to be viable. Kerala is a small state compared to Hindi speakers’ market size, so I only pray they succeed. LP records are still getting issued for Hindi movie songs, so the market-size is a determining factor. I am sure Satyam’s initiative is more a result of the owner’s love for the LP than any sound business plan/analysis, and thank him/her for that. I hope they find the niche market viable, I will be buying enough for myself and some friends for my part. watched Paadatha Painkili 1956..merryland productions. poor girls meets rich boy story line with a “painkili” touch..liked it for the originality in dialogue presentation without the dramatic intonations and voice modulations typical of 50-60s movies.Kottayam slang dialogues seem very original. Cant place the heroine..is it Miss Kumari? PN looks very young and handsome in baggy pants and military cropped curly hair. Better than the ones I watched in theaters over the last 2 months. With a modern turntable, vinyl sounds better than CD, which makes me want to buy vinyl..lots of new releases in Hindi. Good initiative by Sathyam..Keep it coming….Its not difficult to get a new turntable these days..even in Kerala. I agree that old timers are longing to collect vinyl records for their nostalgic value. But even enthusiasts from the younger generation are nowadays taking up collection of LP/EP records as a hobby. How far Satyam Audios succeed in bringing out new titles on LPs can be predicted with accuracy only later. Anyway it is a welcome attempt for those who still prefer to listen to songs on record player. Old record players in good working condition are available at Calicut .You may visit http://www.gramophoneworld.com and http://www.gramophonedisc.com for details. I’ve seen new record players imported from Netherlands at Music World 7 months back. The price comes to 6000 to 7000. You can have second hand players at Trivandrum. Try to contact Murugan sounds at Karamana (Nedumkaadu route) There is an elderly man in the shop. Some years back I frequently visited the shop. He got a good collection of players at that time. i dont know whether he is having players now. What you need is a good cartridge; maybe magnetic. In the past, songs recorded in spool tape are brought to Calcutta for converting it to records. I remember the old 78 rpm records released from calcutta. 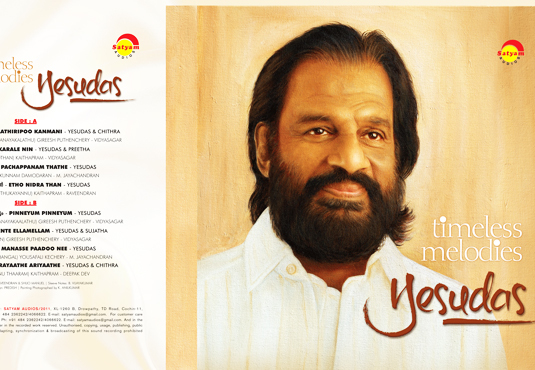 Name of Yesudas is printed as Jessodoss. The song ariyunnilla bhavan ariyunnilla in Kattukurangu is written in the record as ari unni illa. It simply explains that the label is prepared by people who dont know Yesudas nor Malayalam. I am not familiar with the technical aspects of records and player…. all i know is the that big dics is called record. EP means extended play..what does LP mean?? how many songs come in a disc?Does vinyl coating give better quality than shellac/Also the catridge you were talking about is it the same as needle?I havent used one yet. By the time I developed interest in songs most people had cassettes. An expert in records and record player advised me not to get the old kolambi types.. as the needle in that would scratch the disc and make it useless over time.It is hard to replace the needles once it wears out. He advised me to get an electric one preferably philips. your thoughts…i have started looking for a record player now that old records are available..
avoid Kolambi at all costs! Murugan sounds is on karamana route or nedumangadu route?? An LP record means Long Play record. These are released both in 33 and 45 RPM. Recordings in vinyl are good than the shellac type. In an LP there may be 8 to 12 songs. That is the ideal number. There are LP records with twenty songs. When I wrote my comment on Sathyam Audios releasing L P Records, of the singers and musical artists most worthy of appearing in new gramophone records, I forgot to mention a few immortal names which I think was an unpardonable offence. They are L.P.R.Varma, K.S.George, Santha Devi, P.Leela, P.Suseela , Sulochana and Brahmanandan. I really loved them all for enchanting through amplified records and also through All India Radio. The really thrilling were those drama songs including those of KPAC which are not available now. By KPAC Songs I mean those songs which are not aired and stopped in the middle irreverently by the Communist Parties. Bringing the George songs would be a great tribute to him. After singing all those fine and touching songs for the communist party, in his old age, poverty and disease, in Trivandrum during an election, he appeared to sing for Congress party. He was cruelly beaten by his once comrades. Even now they do not feel it a shame to air his songs through loud speakers in their meetings. His songs were actually blackened out by hysteric communists in Kerala. Regarding L P R Varma, a fine collection of his original records are kept safe by a noble man who married into his family. Unfortunately I forgot his name whom for this purpose I had once contacted. When I was a boy I eagerly awaited for the local mike set shop to open and play EPs and LPs amplified through horn-type loud speakers. When gramophone records begin to play we will have to wait a while for the actual song to begin. The sound of the magnetic needle moving through the groves of the record before the song begins was the greatest thrill. In those times the finery of all songs were the Tabala. Most often in those times, I listened to those songs especially to get thrilled by the exquisiteness of Tabala playing in cinema music. If some body has any doubts, just listen to the famous song, Arayilotta Munduduttha Penne. Malayalam cinema music producers then had a fine connoisseurship of finery in background and instrumental music. The bits of those times are surpassed by none living today including A.R.Rahman or the above mentioned Jayachandran. In fact, what those ancient music directors viewed before their minds’ eye were these gramophone records taking their songs to immortality. These gramophone records had another unique speciality. They provided a certain gap between two songs during which respite the listener could slowly release himself from the sweet clutches of the previous song and prepare himself for the rare experiences of the coming song. To express in other words, he had time to take breath. This gap which gramophone records provided was vital in retaining alive the interest in and the power to distinguish between the good and bad of Malayalam cinema music. Listening to these songs I became a singer and a poet and then a writer. Sathyam Audios did the right thing. Let the records come, the gramophone players will surely follow. But one thing has to be particularly noted here. The only one song worth listening in the presently released record is Pinneyum Pinneyum which is perfect. All others are rubbish, in my view. I have 45 years experience in listening to good music. If they are going to produce collections such as this, they will not break even, unless makers of such bad music purchases them in bulk. Turn to the finery of A.M.Raja, Kamukara, Udayabhanu, P.B.Sreenivas, Jesudas, Jayachandran. And if I mention the liquid marvels of S.Janaki, the new wave music director M.Jayachandran please don’t be offended. This is a bit like reinventing the wheel. Who has a turntable nowadays anyhow…?